No general manager in the NHL has been more active this summer than Doug Armstrong of the St. Louis Blues. Though his team missed the playoffs by just one point in 2017-18, Armstrong took strides to overhaul his roster through trade and free agency. Now, the Blues have a brand new look, but one question remains: will inconsistent goaltender Jake Allen be able to find his stride and support the new team in front of him, or will he be the glitch in the system that derails Armstrong’s renovated roster? Jake Allen has been the Blues’ long-term solution in net for many years. The team selected Allen with the 34th pick in the 2008 NHL Entry Draft, making him the third goalie off the board in that season (the two drafted before him, Chet Pickard and Tom McCollum, never made a significant NHL impact). Jake was tabbed early as “the goalie of the future,” someone who might finally be able to solve their longstanding need at the position. In the ten years before Allen’s selection in the draft, the Blues had seen six different goalies start a majority of the games in one season. Allen excelled in his junior career, playing for both St. John’s/Montreal and Drummondville. In his final junior season, Allen went 29-14 in 45 games (and an impressive 18-3 after being traded to Drummondville) and posted a .922 SV%, achievements which earned him the Jacques Plante Trophy, awarded to the goalie of the year in the QMJHL. 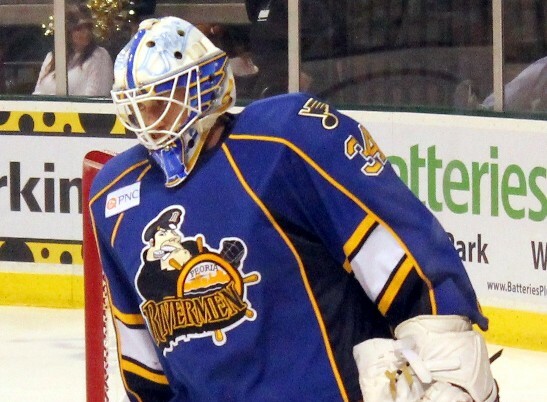 Allen continued to impress in his next career stage, the AHL. All told, he spent parts of four seasons in the AHL, never posting a SV% below .904 nor a Goals Against Average (GAA) above 2.93. The pinnacle of Allen’s AHL career would earn him yet another award. In 2013-14, Allen went 33-16 in 52 games, posting a 2.03 GAA and a .928 SV%, a performance that won him the Aledge “Baz” Bastien Memorial Award, given each year to the AHL’s best goaltender. The 2013-14 season would mean more to Allen than just a trophy, though. It would also be the performance that earned him a permanent spot with the NHL club. Despite having played a few stints in the NHL in injury relief, Allen made his full-time debut in the 2014-15 season. He played in 37 games, amassing a 22-7 record, along with a .913 SV% and a 2.28 GAA. Allen also collected 4 shutouts in his rookie season, and finished tenth in the Calder Trophy voting for rookie of the year. The Blues went with a goaltending tandem of Allen and Brian Elliott in both 2014-15 and 2015-16, with great effect. Allen was able to learn the speed of the game at the NHL level without having the immense pressure of being a full-time starting goalie. 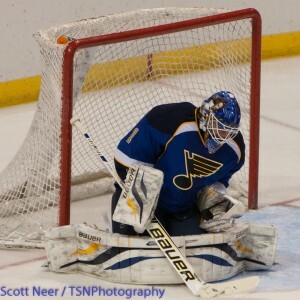 Allen played more games than his counterpart in the 2015-16 season, with a .920 SV% and a 2.35 GAA, and after the season, the Blues determined that he was prepared to be their starting net minder going forward. At the 2016 draft, the team traded Brian Elliott to the Calgary Flames in exchange for a second round pick. A week later, the team would redouble its commitment to Allen, giving him a four year, $17.4 million contract extension while bringing in Carter Hutton as his backup. Problems arose for Allen in his first season without Elliott. Despite a decent start to the season, Allen ran into trouble in the winter. During a stretch in January, he was pulled from four starts in six games, including allowing four goals on ten shots against the Washington Capitals on Jan. 19. The Blues opted to ask Allen to stay home during a road trip at the end of January. Allen’s downturn in play unsurprisingly coincided with the worst stretch of the team’s season, and on Feb. 1, the Blues made the decision to part ways with head coach Ken Hitchcock. When the Blues moved on from Hitchcock and promoted Mike Yeo, they also moved Martin Brodeur down from the front office to be a goalie coach. Whether this was the catalyst or not, Allen immediately returned to form. In Yeo’s first game, Allen saved 26 of 27 shots. The next week, he took home second player of the week honors from the NHL for a week in which he went 3-0-0 with a .967 SV% and one shutout. He performed incredibly well for the rest of the season, and stole a postseason series against the Minnesota Wild, stopping 114 of 117 shots in the first three games alone. Blues fans finished the 2016-17 series with a high degree of confidence, despite his mid-season struggles. But concerns arose again when Allen entered an eerily familiar slump in the middle of the 2017-18 season. Once again, Allen played stellar hockey in the early months of the year. He went 7-2-1 with a 2.46 GAA and a .921 SV% in the month of October, and while the team’s performance slipped, Allen continued to play well in goal during November and December. Once again, though, his performance cratered in the month of January. Allen was only asked to start two games that month, and he lost them both, with a GAA of 4.93 and a ghastly SV% of .871. This time, his play did not rebound in February, and Carter Hutton was entrusted with more and more of the work as the Blues fought for their playoff lives. Hutton ultimately sustained an injury, forcing Allen back into the net. From March on, he played well enough, but the damage had been done and the Blues missed the playoffs for the first time in six years. After two inconsistent seasons, Allen stands at something of a career crossroads. He still has three years remaining on a lucrative contract, but that deal will look like an albatross for the team if he struggles again this year. 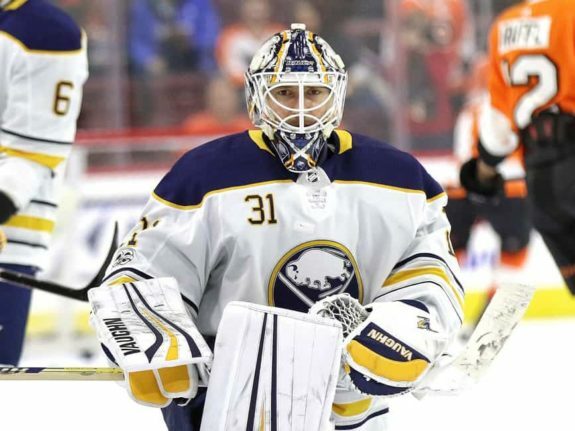 Moreover, Armstrong took bold action in free agency, letting Carter Hutton walk and bringing in Chad Johnson as the team’s backup. Whether Johnson holds onto the job, or whether promising Blues’ goalie prospect Ville Husso steals it from him, neither is poised to take over the job if Allen falls off the map again in January. The team needs him to succeed. And Allen needs to prove himself. He will be 28 when the puck drops on opening night, and while that is not “old” by any definition, particularly for a goaltender, it is well beyond the time one should still be getting his feet under him. Put bluntly: if Jake Allen severely struggles again this year, he will be permanently labeled “damaged goods.” The Blues will likely be stuck with him for the duration of his contract, and Allen will never be looked at as a reliable, frontline starter. The Blues need Allen to succeed and prove himself to be the kind of goalie he has been billed to be; the kind who has won goalie of the year trophies at multiple levels of competition. With a heavily renovated team, Allen remains the big question mark for the 2018-19 Blues. If he performs well throughout the season, he will turn the Blues from a good team into a legitimate contender, but if he struggles once again, he will dramatically lower the team’s ceiling, and put them in a tight pinch for the future. With all Husso’s promise, he is still years from being a regular NHL starter, if he reaches that level at all, and the team needs Allen to shoulder the load until then. With all of that said, there are reasons for hope with Jake Allen. All the tools are there, as is the athleticism. No one has ever questioned Jake Allen’s physical ability. And moments like the postseason series against the Wild show that, at his very best, there are few better than him in the NHL. 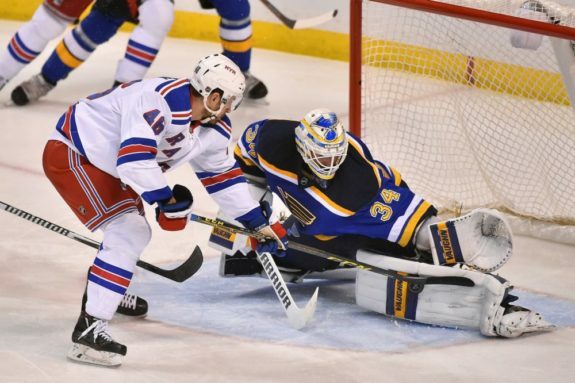 With a hugely altered roster, including many new faces who will assist on the penalty kill, the Blues are in a much better position to support Allen than they were last year, which is why some have labeled him a top candidate to rebound in net this year. Now, the Blues just need Allen to justify the faith they’ve put in him, and show what a truly great goaltender he can be.